Mamata Banerjee also said the KIFF was setting new standards with the people's participation and urged the people to rise above barriers. In an apparent dig at the BJP, West Bengal Chief Minister Mamata Banerjee said on Saturday some people were only capable of criticising the government's action, but lacked the ability to accomplish a single thing on their own. 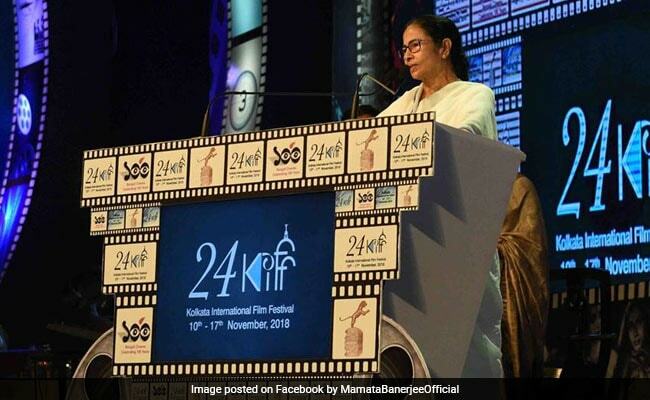 Speaking at the inauguration of the 24th Kolkata International Film Festival, Ms Banerjee said the KIFF was setting new standards with the people's participation and urged the people to rise above barriers, stay united and to believe in unity "which is our core strength". "Some people only keep criticising our deeds. I tell them either do things if you can or leave the field. Some people only talk negatively about festivals. My question to them is why shouldn't there be festivals in our lives?" the chief minister said, without naming the Bharatiya Janata Party. Opposition parties, especially the BJP, have been criticising Ms Banerjee for her government's support to festivals, including the Durga Puja carnival and donations to puja committees, at a time there were "no investments and employment opportunities" in the state. "Do you want to see people cry only? Do you have an issue if people smile?" she asked, asserting that despite the criticism by some people, her government would keep backing festivals -- from Durga Puja to Christmas, and now the film festival. "We will support organising every festival with equal enthusiasm. Durga Puja, Kali Puja and Diwali had just been celebrated across Bengal with enthusiasm. Chhath Puja, Jagadhatri Puja and Christmas are coming, and will be celebrated with equal enthusiasm by the people of the state," Ms Banerjee told the 20,000-strong audience at Netaji Indoor Stadium here. "Festivals bring light and hope in the lives of people and 2019 will be happier," the Trinamool Congress chief said. Referring to the erstwhile Left Front government in the state, Ms Banerjee said: "The status of the KIFF was on a downslide before we (TMC) came to power (in 2011). And we restored the lost glory." Recalling that the KIFF inaugural ceremony was formerly being held at state-run Nandan auditorium, Ms Banerjee said some people had raised doubts when the venue was shifted to the present location. "Now, 20,000 people assemble at the Netaji Indoor Stadium for the KIFF inaugural ceremony every year and watch the inaugural film." "We showed things can be done if you want to," she said, adding that the inauguration of the 25th KIFF next year might take place at the Salt Lake stadium to accommodate over a lakh people. Turning to the dignitaries on the podium, including Amitabh Bachchan, Jaya Bachchan and Shah Rukh Khan, she said, "We will seek guidance from Amit ji and Shah Rukh about how to hold the 25th edition of the KIFF in a grander way by including common people." Waheeda Rehman, Mahesh Bhatt, Nandita Das, celebrated Iranian director Majid Majidi and several Australian filmmakers were present at the inauguration ceremony. Australia is the focus country at the KIFF this year.